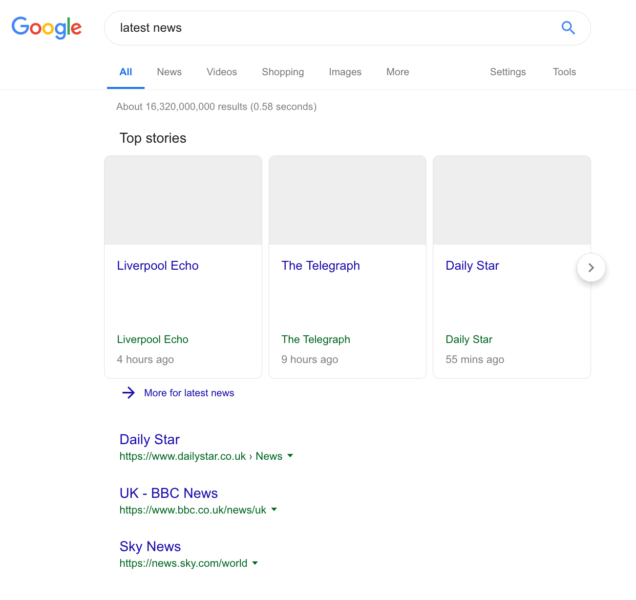 Although not finalized yet, Article 11 of the directive states that aggregators must pay licensing fees to content creators in order to feature snippets, and this will affect Google immensely, particularly when it comes to surfacing news results. Search Engine Land was given access to a test Google is running that produces bare-bones search results without any infringing snippets. Below is what they may end up looking like. It would be an understatement to say that this is not good news for end users. Maybe Google would be able to show a little more than just links and site names as above, but it serves to highlight the potentially seismic ramifications the new legislation could have for all news aggregators. Other possible outcomes could see Google select just a few sources for which it will pay licensing fees — that would end up hurting small publishers — or it could just stop showing such results altogether. Google News in Spain was closed down back in 2014 due to a similar copyright licensing law passed in the country, and it's not unthinkable that Google would do the same for the whole of Europe if it can't find a workable solution. Whatever happens, it seems clear that users are going to suffer as a result.